Every year, UTRGV’s Office of Community Relations reaches over 10,000 K-12 students across the Rio Grande Valley through community-based outreach programs. 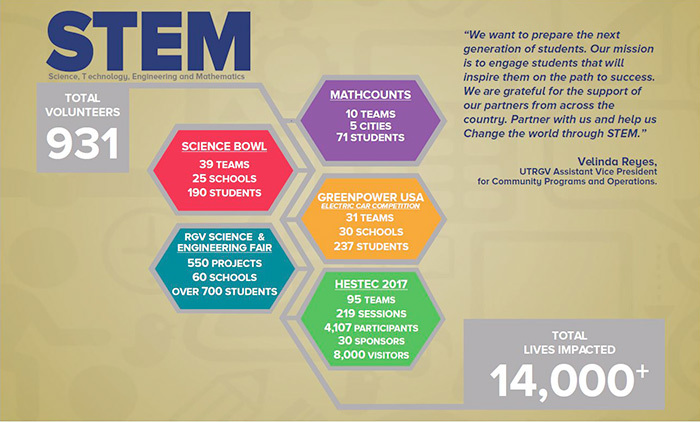 HESTEC Week, the Rio Grande Valley Regional Science and Engineering Fair, the regional Science Bowl, the regional MATHCOUNTS competition and the HESTEC GreenPowerUSA South Texas Electric Car Competition are geared toward science, technology engineering and mathematics (STEM) education and career awareness for students of all ages in the Rio Grande Valley. UTRGV advanced 24 secondary level students to state and/or national competitions.